Book cover courtesy of the author. Head shot by Sam Bond Photography. 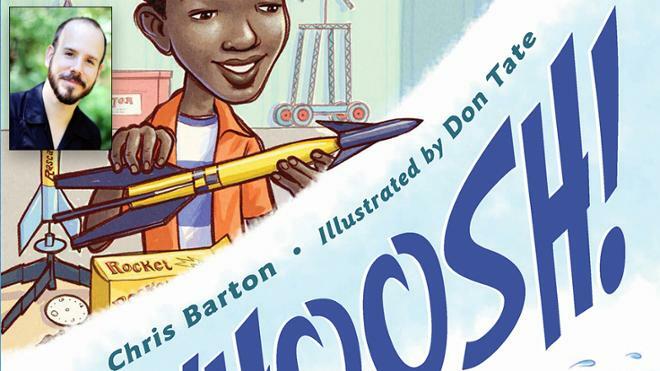 Join children’s author Chris Barton, who will offer a talk and book signing for the University community on October 10, 2018. Barton is a popular and eclectic author who has written humorous picture books as well as biographies of diverse and underrepresented figures in history and science. This event is sponsored by the School of Arts & Sciences, Boatwright Memorial Library and the SPCS Graduate Education program. The event is free and open to the public. Chris Barton is the author of picture books including bestseller Shark Vs. Train, Sibert Honor-winning The Day-Glo Brothers, and Whoosh! : Lonnie Johnson's Super-Soaking Stream of Inventions, included on 18 state reading lists. His newest books include Dazzle Ships, the Mighty Truck early-reader series, and What Do You Do with a Voice Like That? The Story of Extraordinary Congresswoman Barbara Jordan. Barton and his wife, YA/middle-grade novelist Jennifer Ziegler, live in Austin, Texas, where Chris has advocated for greater diversity in children’s literature by co-founding the Modern First Library program with BookPeople. For more information about him, please visit www.chrisbarton.info.